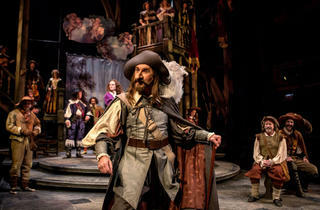 Harry Groener makes an enchanting Cyrano, but the other two corners of this play's central love triangle don't hold up. Chicago Shakespeare Theater reunites Harry Groener and Penny Metropulos, the actor-director team behind its acclaimed 2011 production of The Madness of George III, to bring us Cyrano de Bergerac, Edmond Rostand's play about an extraordinary poet cursed with a remarkably large nose and an impossible love. The object of Cyrano’s affections is Roxane (Julie Jesneck), his cousin and childhood friend. However, a handsome but not especially bright young man Christian (Nick Dillenburg) is the object of hers. Because Christian lacks the words to woo Roxane on his own, Cyrano—believing himself too physically grotesque to have his feelings requited—writes the words for him. Anthony Burgess’s adaptation is tight and well-paced despite its verbosity. The actors tackle the text with a plainspoken naturalism that gives each performance an air of comfort and confidence, if at times anachronistic next to Susan E. Mickey’s more period-perfect costume design. Whatever this takes away from the accuracy of the play’s world, it more than makes up for in the immediacy it lends to the story and characters. 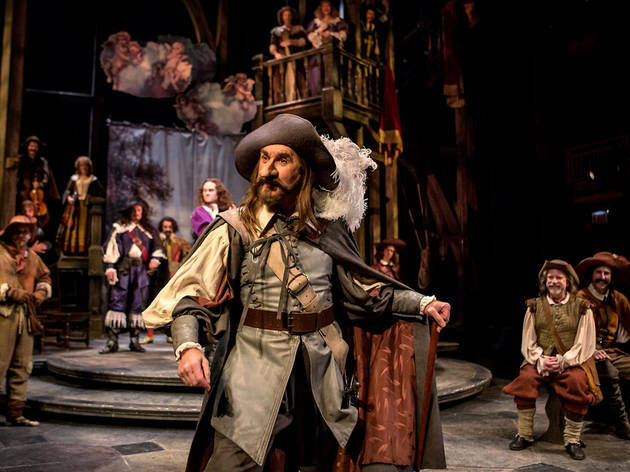 With a “historical” artifice intact, performances run the danger of leaning toward Montfleury—the staged, stilted, false actor whom Cyrano makes short work of in the very first scene. Here, there is a sense of play, and nowhere is this more apparent than in Harry Groener’s show-stealing turn in the title role. Connected to every moment, with a seemingly infinite bag of tricks at his disposal, Groener treats every word as a weapon and doesn’t waste a shot. Ross Lehman’s earnest Ragueneau and Sean Fortunato’s touchingly loyal Le Bret are stand-outs in a solid ensemble, but it’s clear that Groener does a lot of the heavy lifting. The weakness of this production is, sadly, in its central romantic conflict; Groener holds up his end, but there's a serious lack of heat. Jesneck’s Roxane comes off as shallow from the get-go, at the expense of us seeing what inspires such a tragic, all-consuming love in Cyrano. Only when she lambasts Christian for his failure to produce any grander words than “I love you” does she begin to feel like Cyrano’s equal, but even here anger and petulance dominates any other layers of her character that moment could have revealed. Dillenburg’s Christian, meanwhile, just doesn’t seem that into Roxane. We don’t have to root for their success, but I never got the sense that either of them believed in it at all. As a consequence, reveals go flat, and that final scene—in which Cyrano is finally reunited with his words—feels unearned. As good as many elements of this production are, if it can only intellectualize Cyrano’s devotion and not cause us to feel it ourselves, it may be missing something of the spirit of its subject.